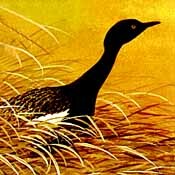 Both floricans (this and Lesser Florican E. indica) of the Indian subcontinent are highly endangered. This impressive bird exists only in fragmentary wet grasslands on the border of Nepal & India, and a tiny population is in Cambodia & adjacent Vietnam. The Lesser may be rarer but this is bigger and more spectacular; I also admit to admiring the way its name rolls off the tongue. The great Indian Bustard Ardeotis nigriceps, also endangered, is equally wonderful but is quite similar to the big bustards of Australasia & east Africa [see my "big bustards" page]. 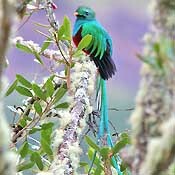 Any quetzal is great, but the incredibly long train of this species is in a world apart. There are a variety of spots were it can be found from s. Mexico to Costa Rica to w. Panama but it is always special to see the brilliant green bird outshining the great green canopy in which it exists, and then the male does incredible courtship flights above the canopy! 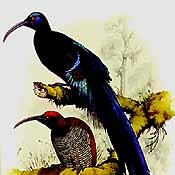 It is the national bird of Guatemala and many legends are associated with it. There are 4 sicklebills in New Guinea, each one spectacular, each one hard to find. Brown Sicklebill E. meyeri is the "easiest" but Black is very difficult, shy and endangered. It occurs high in the mountains, including the Arfaks, where it is restricted to upper montane cloud forest. Its absolutely unbelievable display posture was captured on film in the BBC's Attenborough in Paradise. Black-billed E. albertisi & Pale-billed E. bruijnii are the other great sicklebills — oh, to see them all! 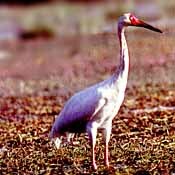 The gigantic white crane of Asia breeds in two distinct populations in n. Russia. The eastern flock, which holds 95% of the world's 2500 birds, winters in China; the western birds migrate to India and were once the headline species wintering at Bharatpur in Rajasthan. Now one or two are there some winters, and none in others. The Japanese or Red-crowned Crane Grus vipio would be another excellent choice. It is the Old World's second rarest crane, intimately woven into Japanese culture, and I'm told that seeing a flock of dancing cranes on a wintry day is a great spectacle. 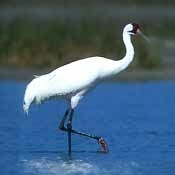 Nesting in Wood Buffalo NP, Canada, then migrating across the Great Plains to reach its wintering grounds in coastal Texas, the Whooping Crane is one of the world's rarest birds. The population fluctuates at around 80–100 birds; efforts to establish a second flock migrant flock continue. It is a huge, stately, and impressive crane but is not hard to see (take a boat ride from Aransas). It is a North American success story that the species survives at all. "What's in a name?" Some call this "Bali Starling" but the word "starling" has negative connotations. I prefer Bali Myna. It is critically Endangered because it has an extremely small range and population and, despite conservation intervention, the number of mature individuals continues to decline owing to illegal poaching. Only a dozen wild birds remained in 2000, but many are in captivity and may be reintroduced to its only site: Bali Barat Nat'l Park, Bali. On the verge of extinction in peninsular Thailand, its tragic decline and then hopeful re-discovery in extreme s. Burma have been features of Oriental headlines this decade. Before that it had 'disappeared' for 34 years without any reports. 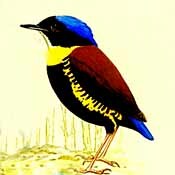 It is thought that there are now less than 30 pairs left; local guides have both helped and hindered the bird's recovery. This has become a primary conservation issue for much of southeast Asia. Evoking a feeling of wilderness and pre-history, they nearly went extinct in the 1980s. All wild condors were trapped for a captive breeding program by 1987. Dozens have been released back into the wild in s. Calif. mountains, along the Big Sur coast, and in the Grand Canyon. 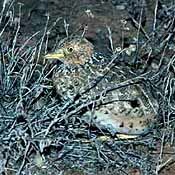 The first active nests were in 2002 and new youngster are now wild-bred annually. 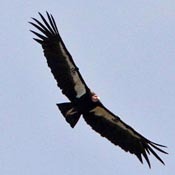 They can be seen in remote s. CA mountains plus Pinnacles NM & along the Big Sur coast in c. CA[see Condors in Monterey page]. 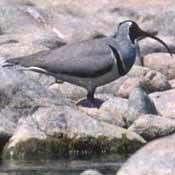 Breeding only along remote montane rocky streambeds in central Asia, this has been a highly prized species for birders for years. In its own family (Ibidorhynchidae), this adds to its allure. I am influenced in making this pick by the thoughts of the late Arnold Small, who once stated this as the rarest bird he'd seen in the world (and he'd seen about 2/3 of the world's birds). Many birders have had to venture into Bhutan, but it has been recently found in winter along certain Himalayan foothill streams in n. India & Nepal. Frank Jarvis painted the Bali Myna; from Birds of Bali (1989) by Victor Mason (Periplus Editions).